The PanelView Plus Learning System – AB ControlLogix (89-PVAB5500) adds to the Programmable Controller Troubleshooting Workstation (890-PECB) and the PLC Troubleshooting Learning System-AB ControlLogix (890-AB5500) to teach how to program and operate a PanelView Plus 6 1000 HMI operator interface terminal. Human-Machine Interface (HMI) operator stations have become commonplace in modern industry, because they eliminate wiring, enable operator functions to be modified in software, and provide the ability for the operator to monitor PLC operations data. In addition to the 890-PECB and 890-AB5500, this system requires a PLC EtherNet Learning System – ControlLogix (89-EN-AB5500) and FactoryTalk View ME Programming Software. The HMI training system includes the PanelView Plus 6 1000 with touch screen, Ethernet cable, and mounting console. This training system will be used to cover major topic areas like application editing, tags and communications, input and output objects, local messages and alarms, diagnostics, and information messages. This system combines industry-standard components for real-world learning and durability and combines it with in-depth curriculum, so that learners can practice hands-on skills while gaining the knowledge necessary to understand the reasons behind the skills that they’re practicing. 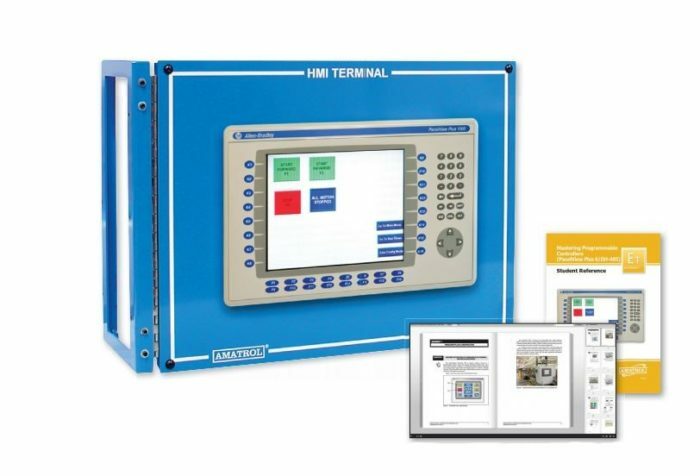 The HMI training system is designed for ControlLogix processors and includes a PanelView Plus frame assembly, PanelView Plus 6 1000 touch screen terminal, and a 5-ft. Ethernet cable. PanelView Plus 6 1000 terminals are used for a wide variety of machine control and monitoring applications. Learners will practice some of these applications via hands-on skills, such as transferring a Studio-ME application to a PanelView Plus 6 terminal, configuring diagnostic messages for a PanelView Plus 6 application, and creating and configuring the following: a display list selector object; push button object; numeric input object; and local message display object. This system’s curriculum will cover industry-relevant topics, including how to operate, interface, and program PanelView operator terminals. More specifically, this course will discuss objectives such as: how to configure communication for Studio-ME application; two classifications of graphic objects; the operation of six push button objects; the function of numeric output objects; and how to configure diagnostic messages. In addition to the included printed curriculum, Amatrol also offers this course in an online eBook format. Amatrol’s eBooks provide easy, quick navigation and searchable course content in an online, computer-based format. The 89-PVAB5500 is only one of the options you can use with the 890-PECB equipped with the 890-AB5500. Other options include the PLC Analog Learning System (89-AS-AB5500), PLC ControlNet Learning System (89-CN-AB5500), and PLC EtherNet Learning System (89-EN-AB5500). A sample copy of the Mastering Programmable Controllers Reference Guide is also included with the system for your evaluation. Sourced from the system’s curriculum, the Student Reference Guide takes the entire series’ technical content contained in the learning objectives and combines them into one perfectly-bound book. Student Reference Guides supplement this course by providing a condensed, inexpensive reference tool that learners will find invaluable once they finish their training, making it the perfect course takeaway.